These blocks are extremely robust, maintaining form and performance for extensive periods of time. 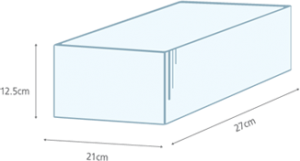 10.5 kg dry ice blocks are extremely robust and maintain their form and performance for extensive periods of time. Our minimum order quantity is a single block of 10.5 kg. There is no maximum order, so we can supply you with as many blocks as you need, delivered when you need it! All our dry ice blocks are manufactured to order packed to each customer’s individual requirements. Each block is individually wrapped for easy handling. These containers are specially designed to deliver market leading thermal performance, boasting many benefits including being ergonomic, lockable, stackable and manufactured from food-safe materials. Typically these containers are used for large quantities and where there are means to receive and store them. Smaller quantities (1 or 2 blocks for example) are packed within specially designed robust, easily transportable and disposable thermal boxes. Delivery options are tailored for each of your specific order requirements. Smaller quantities of 10.5 kg dry ice blocks (usually under 105kg) are dispatched directly and securely approved courier, all delivered at a time to suit you. How do I order 10.5kg dry ice blocks?